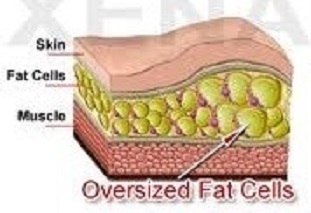 Fat cells – do they ever go away??? Well, let’s say that you can grow more of them, you can shrink them but the majority of studies & articles I read said that they never go away – just shrink & ready to expand again at a moment’s notice! I read a ton on this & most say fat cells never go away! I KNEW I WAS RIGHT ABOUT THIS BEING A FAT KID! MY BODY ALWAYS WANT TO EXPAND THOSE FRIGGIN FAT CELLS! So what have I written about for years & years – we need both a better food plan AND exercise to lose the weight & maintain that loss long-term BUT as much as you don’t like to hear it – FOOD CHOICES are at least 75% of the battle! Whether you like it or not, you are going to have to find a way to eat better AND find that way that you can stick with long-term. Again, as I always write – if you hate what you are eating or doing, you are not going to stick with it! FIND SOMETHING YOU CAN LIVE WITH LONG TERM! Change it along the way but you have to be able to be happy with what you’re doing to make it work & succeed at it! FAT CELLS ARE GOING TO STAY WITH US FOR LIFE! THEY ARE GOING TO FIGHT US & WANT TO EXPAND – ESPECIALLY IF YOU WERE OVERWEIGHT LIKE ME WHEN YOU WERE YOUNGER!!!! Really, this is f’d up news but DON’T GIVE UP!!!! Your health & well being are so worth this effort to fight those friggin fat cells not to mention all the things you will be able to do for yourself & with your family & kids & grandkids. NEVER GIVE UP!!! This is fascinating Jody. You really break down the cycle of the fat cells and patterns from inconsistent living. I know fat cells definitely settle in a particular area of my body and I can feel the expansion in my thighs and hips if I’m not careful about what I eat. For me, the cells seem to settle in my lower body. This makes me even more convinced that we need a sustainable plan overall. All cells burn some calories, just muscle cells burn a lot more when we use them, and a little more at rest. As you say, how we eat is the most productive way to deal with excessive fat. Next Post: Sometimes I Hate It but I Do It Anyway!